This EP is the result of a request from Thomas Campbell (Galaxia) who came to some live improv shows Jet Black Crayon used to do on Sundays at Amnesia in San Francisco. He wanted the band to capture the drunken meandering vibe of those shows for this EP. At the shows Tommy Guerrero, Monte Vallier, Gadget, and Tim DeGaugh would usually do two sets of an hour to an hour-and-a-half, playing some Jet Black Crayon songs but mostly just making things up on the spot and rolling with them. The improvisations were atmospheric, and sometimes got heavy in a funk/soul sort of way. 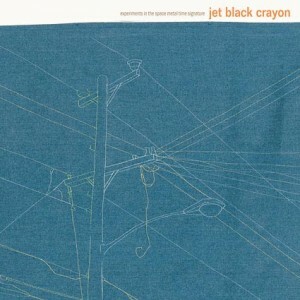 Experiments In The Space Metal Time Signature is Jet Black Crayon’s favorite parts of a couple hours’ worth of the studio recordings performed similarly.